First, in business? A suite designed for the pointy end, which ended up in business? Long story short: there are some truly spectacular business class seats, virtually negating any reason to bother with First Class. If you are in search of the very best business class experiences, seek out these three bespoke seat designs. What: This was originally a concept for first class, which was slightly modified to become an industry standard business class seat. The result: a stunning achievement. Direct aisle access for each passenger, extra large entertainment screens and top quality privacy. Unlike many seats which require passengers to wiggle around for sleep comfort, this is wide open – combining the best in privacy with the comfort of more open seating plans. X Factors: Privacy, foot space, XL entertainment. Who: Korean Air (747-8, select 777), Oman Air (787, Japan Airlines (787, 777-300). What: XL is definitely a good start. This seat is one of the roomiest business class offerings out there, and quickly becoming a fan favorite. The seat sets itself apart with very intuitive storage space, connectivity and seriously large entertainment screens. Delta’s highly touted new suite is a variation of this seat. Singapore Airlines renowned new business seats by JPA Design are a similar evolution of this concept. X Factors: Storage space, bed width, modern intuitive interfaces. Who: Delta (A350, A330 soon), Qantas (A330, 787), SAS (A330), Philippines (select 777). Malaysian uses a variation of the suite in First Class on the A350! What: A seat which would be a delight in first class, is a treat in business class. Qatar Airways designed a bespoke seat to launch their “first in business” initiative. Each suite is fully enclosed, with a door for privacy. State of the art entertainment, connectivity and service make this a very powerful statement. It’s arguably the best business class in the world. X Factors: Double bed for two passengers, XL entertainment, privacy door. Who: Qatar Airways (select 777-300, soon to be A350). What: When it’s hard to see other passengers, you know you’re in a great seat. But if you want to fly with someone, you can be quite social too. These Zodiac seats offer some of the most flexibility in business class, with perfect solutions for each type of traveler. All aisle access, large screens and nicely elevated tray tables make it easy to switch between dining and relaxation. X Factors: Private window seats, comfortable lounge position, top notch entertainment. Who: Emirates (A380), ANA (787, 777). United Polaris is a variant of this seat. What: Zodiac, BE Aerospace and Cirrus each make variants of this highly agreeable business class seat. There are no revolutionary bells and whistles like closed doors, but for conducting actual business – it offers amongst the very best tray space in the business and solid privacy too. Window seats face toward windows and are raved by solo travelers. X Factors: Tray space, sleep comfort, power ports. Who: American (787, 777-300), Cathay Pacific (777-300, A350), Qatar (787, A350, A380), Air Canada (787, 777), Finnair (A350), SriLankan (A330), Air France (777), Avianca (787). What’s your favorite business class seat design, and why? It’s a ground-up new design, not an extension of the SkyLounge like on ANA. DL merely slapping a door on the VantageXL (and making the interior space rather cramped can count as an extension though. 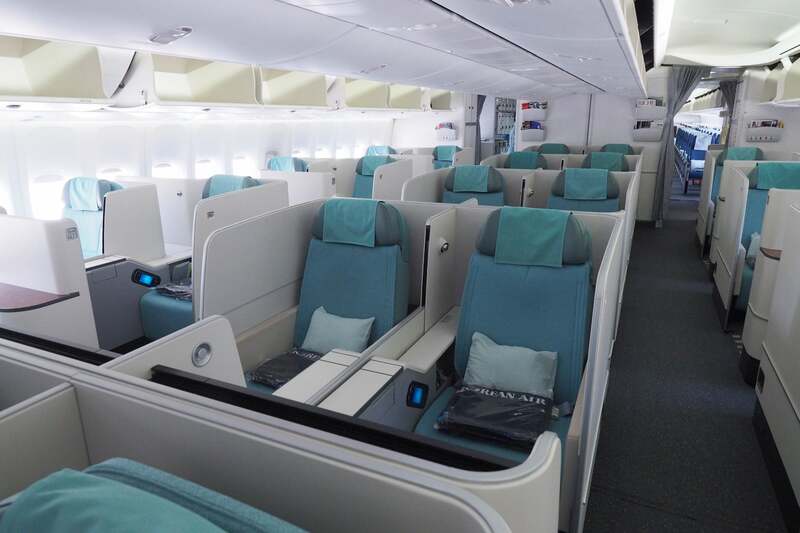 One thing that not many bloggers are not noticing or mentioning is that “BE Aerospace Apex Suite” on Korean Air is a a lot nicer and wider than the version on JAL. I’ve flown both. JAL fits 2-3-2 (all staggered) in their 777 while KAL does 2-2-2 with center 2 that can be great for a family or couple with partition down. You can’t do that with JAL 777. I have to say KAL is at least 4-5 inches winder than JAL one. Really looking forward to trying the APEX suite sometime in 2019 on KAL. The privacy and space would be a dream for us. Also, as much as I liked the reverse herringbone on Qatar (and we’re trying them again on Iberia this year), my wife and I ended up enjoying the “old” 2-2-2 777 seat pairs more for the open feel. So we’re also trying to find a way to grab the Q Suite for the best of both worlds next year as well. AA has reverse herringbone on A330’s too (in fact US Airways was the first airline to have them when they introduced their Envoy Suites product. American has the same reverse herringbone seats on their A330s. The KAL seat is fantastic, but their soft product leave a lot to desire compared to JAL. Unless they changed things they offer economy sized pillow and a very light blanket. No mid flight hot snacks, and randomly serve the second meal like 4-5 hours before landing (at least on eastbound tpac). JAL’s seat might be narrower, but their overall product is just better. Their 777s use some sort of Recaro seat with the static footrest on the front. 2-3-2 configuration.